Our designs are flexible. 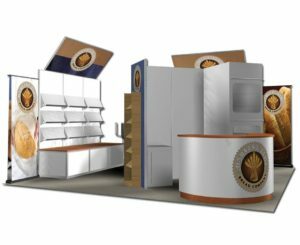 Use the examples below to mix and match display elements to create a booth that works best with your brand. 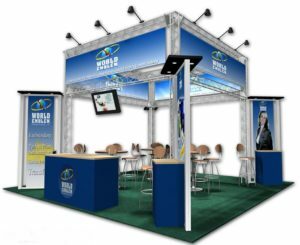 Our 20x20 trade show booth rentals are not limited to what you see here. Browse our options to find the look you're going for, then contact our team to get a free design rendering with your changes applied. 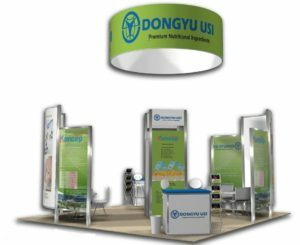 We provide our displays in Los Angeles and all around the US. Cardinus 20x20 is a highly unique exhibit. With a tall 20ft back panel wall and stem lights to emphasize the company logo. This exhibit also includes two interactive displays, reception area, and storage located underneath. 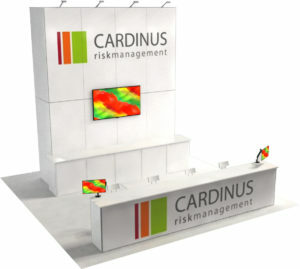 The Cardinus 20x20 is a unique booth option. Kloecker 20x20 is an industrially based look exhibit. With metal frame and four outstretched kiosks. 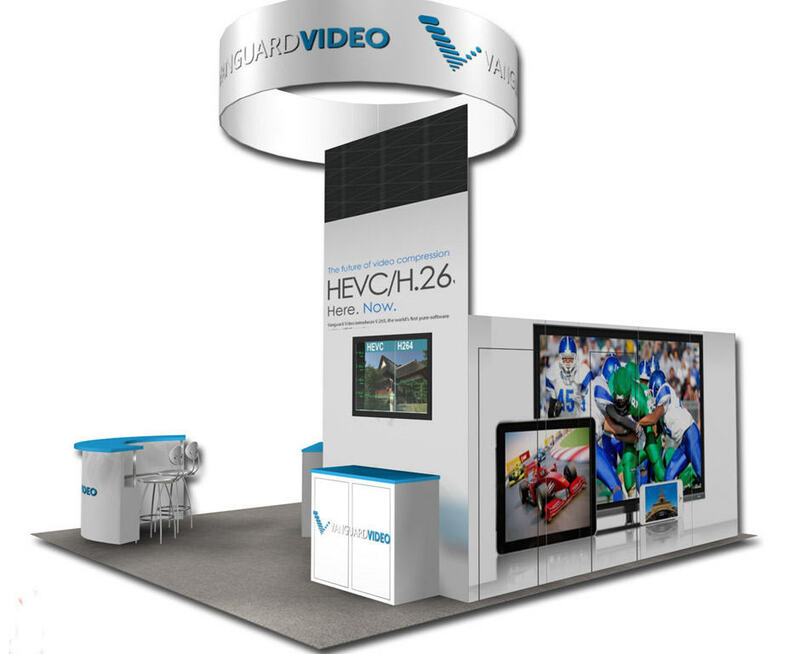 The exhibit includes wrap around graphics and four digital monitors to display company. The center area of the exhibit also has open interactive learning space ideal for a 20x20. DongYu 20x20 plays on both the industrial and open spacing for its feel. With hanging signs metal frames and a lot of signage. The exhibit also includes meeting space and set up with product displays. Harvest 20x20 is a great retail exhibit option. With multiple shelving options and a ton of signage and banner stands. The location also has a reception area and interior storage option. 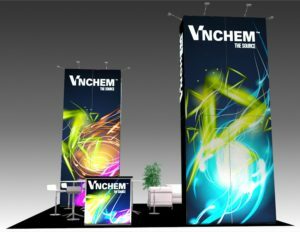 The VinChem exhibit uses two pillars of stem lights and custom panels. Additionally, the exhibit offers couches and meeting space for client sitdowns. Also included in this 20x20 is a front reception area for the meeting point. The Acuative 20x20 offers an enticing exhibit option. 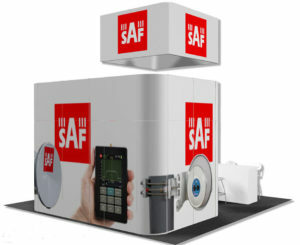 With four interactive kiosks with digital monitors and meeting space located in the center. 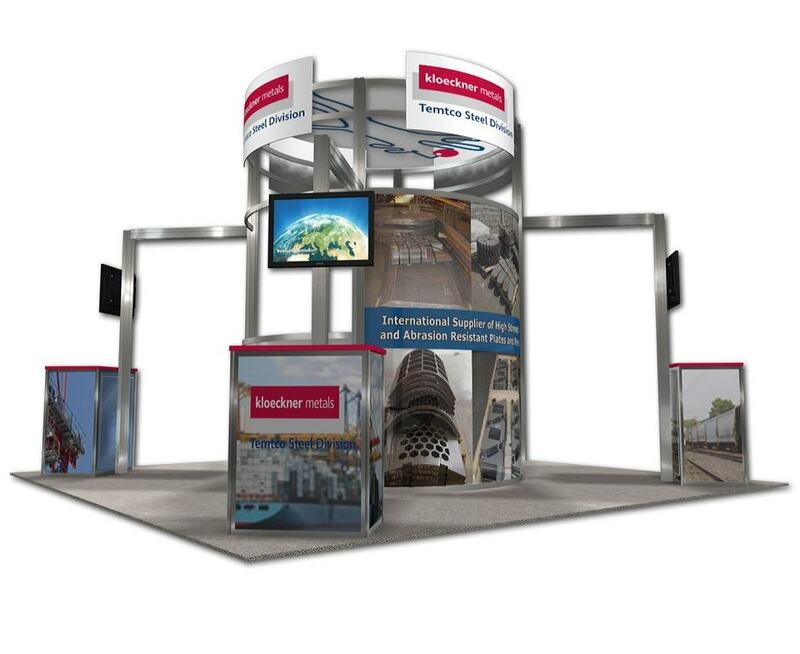 Additionally, the exhibit includes digital wrap around panels with customized graphics. This 20x20 also helps separate itself from others with a circular design. 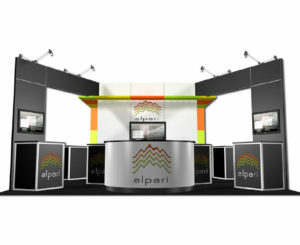 Alpari 20x20 is a great exhibit design for something tucked into a row. From high ceilings offering enhanced visual presence and front reception area. Furthermore, three monitors, stem lighting and duel pedestals increase the overall presence. 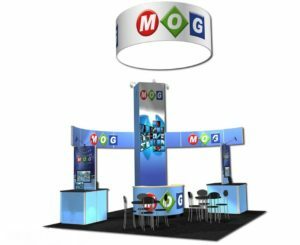 MOG 20x20 use of the custom panel graphics and signage is shown in this exhibit. 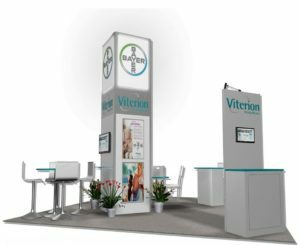 With a circular hanging sign duel meeting areas and product display areas. Additionally, the exhibit has built in desk area and storage offered in the central pillar. World Emblem includes the industrial look and a mix of the modern for this 20x20. 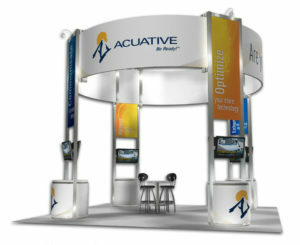 With wrap around signage at the top of the exhibit and four standing signage options. The upper portion of the exhibit includes stem lighting and the interior has multiple meeting spaces. The Comet exhibit is customized with its use of rooms and pillars. With two overhangs creating an exclusive environment layout. This 20x20 also includes panel storage area in the real that doubles as signage. SAF 20x20 offers the distinct option of a hanging sign with completed company graphics. Included with this design is a front reception area and wrap around company graphics. SAF 20x20 is a fantastic design used by many! The Vanguard 20x20 exhibit is a great layout for the spacing allocated. With panel based storage option and monitors, along with desk spaces and table spacing. The exhibit also includes a hanging sign with wraparound graphics to increase the overall look. 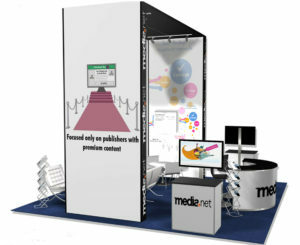 With a completed overhang and digitally printed graphics, the MediaNet is a great 20x20 exhibit. 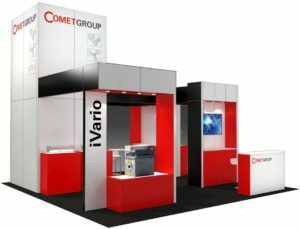 This 20x20 also includes a meeting area with reception area and product display. Finishing the exhibit duel monitors offer interactive product area. The Bayer 20x20 exhibit is a great example of a pharmaceutical setup. With tabletop, meeting spaces a central pillar and multiple monitors. Additionally, the exhibit offers clean-cut prospect, with nice use of plants. This exhibit also includes a nice use of informative signage. 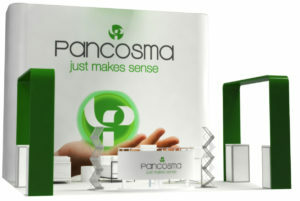 Pancosma 20x20 is unique with its use of archways and pedestals. Additionally, the exhibit offers duel product displays, reception area and full fabric wrapped wall. This modern looking exhibit will be a sure solid hit.